It's my one year blogoversary! This blog was intended to document a pregnancy after losing two sons due to cord problems. Sadly, it has instead turned into an infertility blog. I didn't start blogging until well after the losses. If I had started earlier there would have been a lot of posts about the frustration of dealing with the patronizing, dismissive, and even hostile attitudes of others regarding the loss of my sons. I've often wondered why people are so unwilling to see my babies as people and their loss as a legitimate reason for grief. I think one reason is what I call "habeas corpus". We're all familiar with the legal meaning; in Latin it means literally "(We command that you) bring forth the body." With pregnancy loss, your loss will most likely be met with little sympathy and your grief not viewed as legitimate unless your child was far enough along AND in good enough condition that you can "bring forth the body" for all to see, either by holding a viewing or having photos to show. Otherwise the loss is so intangible to others that it seems completely unreal. By the way, while I do have photos, I choose not to "bring forth the body" by showing them to anyone. A person who needs to see them to take the babies' deaths seriously is not the sort of person I want to show them to. I feel it would only satisfy morbid curiosity and is thus disrespectful to my sons. Since my losses I've noted with extreme annoyance that some bereaved pet owners receive more sympathy and compassion at the death of their dog than I received at the death of my sons. What the . . . ? Has anyone else noticed this? 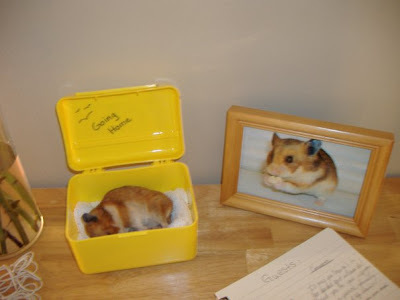 When my sister lost her beloved hamster Squib (whose amusing obituary is included below) she had dozens of mourners at its funeral. Of course, this particular funeral was just a diversion for college students, but plenty of people do take pet deaths this seriously. In contrast, some of my family members were bitterly opposed to us burying our sons because they weren't deemed worth the trouble and expense. It's sickening - animals are being treated more like people all the time, and humans are being treated with less dignity than hamsters. Squib Mesocricetus Auratus passed away Monday, December 17 of causes incident to age (ie NATURAL causes). Abandoned at a young age, she was adopted from the Meijer orphanage in January 2006. Acutely aware of her fortunate situation after living in such squalor, she vowed to champion the cause of homeless hamsters everywhere. This never happened, but it was nice of her to care. Squib was a tolerant, docile beast with a keen mind as hamsters go and a strong love of stunning acrobatics. Her beady little black eyes would light up at the sight of her bungee-jumping harness. Other favorite activities included chewing on things, traveling, sleeping, and the occasional escape. Her one regret in life was that Ellen never petted her. Squib was preceded in death by the predecessor hamster Jerome (thanks Carmen). A viewing will be held Tuesday, December 18 at 7:00, followed by a short but moving funeral. Internment will be on the grounds of Laura's condo. In lieu of flowers, Squib requested that cash donations be made to help alleviate the exorbitant costs of burial and the poor fuel economy of Jaclyn's Jeep. Don't forget that their are not cards to recognized heavenly birthdays in stores either. Annie, I sent you an e-mail. I hope you got it but if not here is my e-mail address.